Our daily lives are saturated with information; we consume supposedly “neutral” media that implicitly supports existing power structures, yet we simultaneously fear “fake news” without critically analyzing the truths and biases that coexist in every message we see or hear. The reality is that all media has an agenda: for hundreds of years, people have used art, culture, graphics, performance, and design as central elements of social and political organizing across all realms of the political spectrum, to spread information and reimagine reality. This exhibition reflects historic and current uses of agitprop, or agitational propaganda, at the intersection of design and political organizing. “Propaganda,” from the same root as “propagate,” refers to information that is shared in support of a cause. In modern times, the word propaganda has been weighted with negative connotations; we aim to reclaim the word and highlight the radical potential of propaganda to instigate change. With the Arab Spring, Occupy, Gezi Park, Black Lives Matter, #NoDAPL, and now the resistance to Donald Trump, we’ve seen a new explosion of agitprop. People of all stripes have come out into the streets, placards and banners in hand, wearing T-shirts and buttons, passing out flyers and stickers to protest social injustice. This boost of political ephemera hasn’t been created in a vacuum—since the advent of the printing press and movable type, political slogans and graphics have been part of our daily existence. Politicized communication is the constant accompaniment to people organizing to improve the lives of their families, communities, and co-workers. 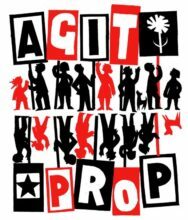 Because so much attention is focused on organizing and activism, now is the perfect time to unearth and unpack the history of agitprop. Where does it come from? Who have been its major practitioners? How have the aesthetics and content evolved over time? And, how can we use it to change the world?